Did you have an enjoyable Sunday breakfast this morning, perhaps one at a nice country buffet? Then while you're sitting there digesting all of that meat and eggs, get a load of this. 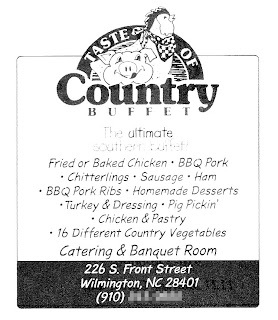 Here's an advertisement for the Taste of Country Buffet in Wilmington, NC. You know it must be good, because the pig featured in the picture above is licking his chops over the hickory-smoked yumminess that will soon be his carcass. If you are interested in more disturbing ads depicting animals celebrating or participating in their own demise, then visit the blog Suicide Food. Meat may be murder....but it's just so lovably wacky!